It has been proven that the code lengths of Tardos’s collusion-secure fingerprinting codes are of theoretically minimal order with respect to the number of adversarial users (pirates). However, the code lengths can be further reduced as some preceding studies have revealed. 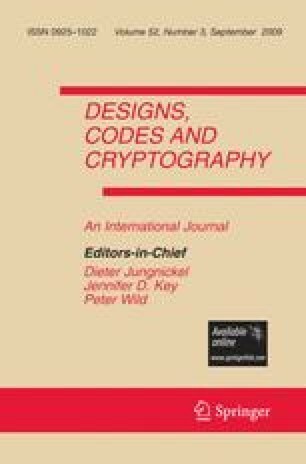 In this article we improve a recent discrete variant of Tardos’s codes, and give a security proof of our codes under an assumption weaker than the original Marking Assumption. Our analysis shows that our codes have significantly shorter lengths than Tardos’s codes. For example, when c = 8, our code length is about 4.94% of Tardos’s code in a practical setting and about 4.62% in a certain limit case. Our code lengths for large c are asymptotically about 5.35% of Tardos’s codes. A part of this work was presented at 17th Applied Algebra, Algebraic Algorithms, and Error Correcting Codes (AAECC-17), Bangalore, India, December 16–20, 2007. Communicated by H. van Tilborg. Nuida K., Hagiwara M., Watanabe H., Imai H.: Optimization of memory usage in Tardos’s fingerprinting codes. Preprint at arXiv repository. http://www.arxiv.org/abs/cs/0610036 (2006). Tardos G.: Optimal probabilistic fingerprint codes. To appear in: Journal of the ACM. Preprint available online at http://www.renyi.hu/~tardos/publications.html.